This will be a flex-start tournament. You must play in, at least, a group of 3. Preferably four or more. We will shoot for having groups tee off every half hour, unless you already have a group of four. You can tee off as early as 9am, and no later than 3pm. We will have some deep fried turkey available while supplies last :) Turkey will be ready around noon. It may be best to communicate in the comments section to find a group prior to arriving. Otherwise, you will have to wait for enough players to create a group. If there is enough interest to start earlier, then I will make accommodations for that. 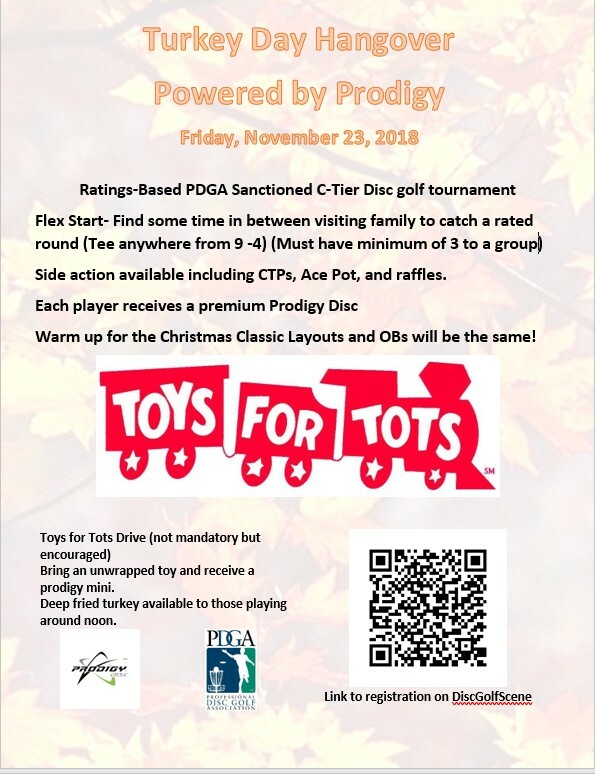 This will also be a Toys for Tots drive. It is encouraged that you bring a new, unwrapped gift, but it is not mandatory. 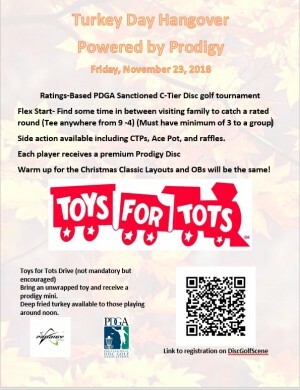 Each player will receive a premium Prodigy disc for participating. The winner of each division will also receive a trophy. Gold will play Gold to Gold. Blue will play Blue to Green. White will play White to Green. All other divisions will play Red to Green. David Radvansky is responsible for all refunds/cancelations.